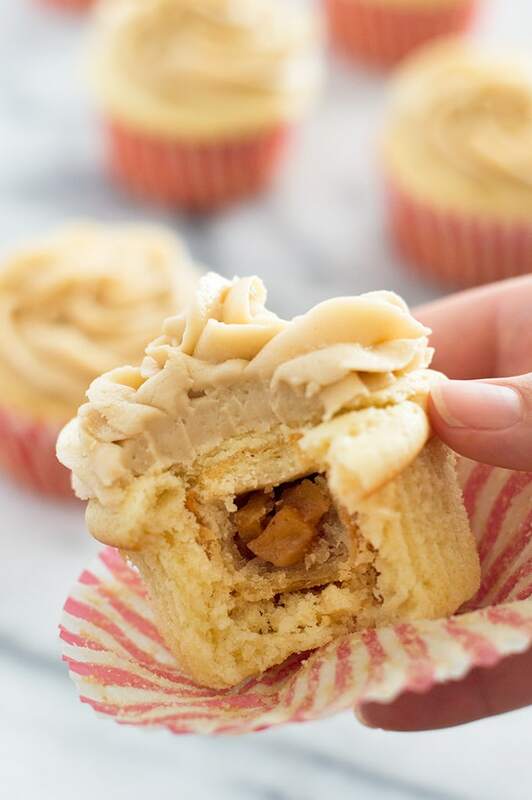 Apple Pie Cupcakes: soft and fluffy vanilla cake wrapped around a miniature apple pie with homemade caramel frosting on top. You’re going to love these! Today’s (barely) creepy recipe in my month of creepy fictional foods (the first post was Hannibal’s Sanguinaccio Dolce, check it out!) is also a part of #Burtoween. What’s Burtoween? Well, you might remember last month I made Jigglypuff Pink Cream Puffs for #Pokenom, hosted by The Gluttonous Geek, where a bunch of fellow bloggers posted Pokemon-inspired recipes across all of our sites. This month, the same group of bloggers is getting together, celebrating Halloween by creating fictional foods inspired by the films of Tim Burton. It’s being hosted by the amazingly talented Carrie of the blog, Witchy Kitchen (you might remember some of her killer Game of Thrones recipes from my Nerdy Recipes Roundup back in May). If you like nerdy things and you like to create recipes, you should join us! You don’t have to have a food blog. You can post your recipes on Instagram or Tumblr, they just have to be original recipes or adapted with credit. It’s a ton of fun and everyone involved is super friendly and awesome. We’ll be running fictional food themed months every month for the foreseeable future (I’m hosting in June, Star Trek y’all–get hyped), so if Burton isn’t your thing, come join the Facebook group and see what’s cooking in the months to come. For my entry, I chose to make a recipe inspired by my favorite Burton film, Big Fish*. What do Apple Pie Cupcakes have to do with Big Fish? I’m so glad you asked! Big Fish is the story of a son who only really knows his father through the outrageous tale tales he tells about his life. Most of the movie is flashbacks where you see those stories play out, and to look at them, they are so over the top, you know that they must be lies. But, throughout the movie as the son comes to know his father better, he discovers that there is actually a grain of truth at the center of all of his father’s stories. It’s one of Burton’s best movies, I cry like a baby every time I watch it, and it’s just a lovely film about the narratives we write for ourselves and the way people come to know us through and despite them. One of my favorite parts of the film is of the town of Spectre, that is at once both the creepiest and most charming small town you’ve ever seen. Among other things, they claim to serve the world’s best apple pie. So I present you with Spectre Apple Pie! And sure, looking at these, when you hear me tell you it’s apple pie, it sounds like a lie, but just like the stories in Big Fish, once you get to the heart of things (take a big ol’ bite), you discover that there’s some truth to my telling of it. That’s right, there’s a tiny little world’s best apple pie stuffed inside! Plus, you know me. I love a project cupcake (exhibit A: S’mores Cupcakes, exhibit B: Captain America Brooklyn Blackout Cupcakes). These are most definitely a project cupcake, but completely rewarding and fun. You start by making these adorable mini pies using my favorite buttermilk pie crust (easy, delicious, and simply the best), stuffed with apples, brown sugar, and other amazing apple pie things. Then you bake them again inside of this super simple one-bowl cupcake recipe. 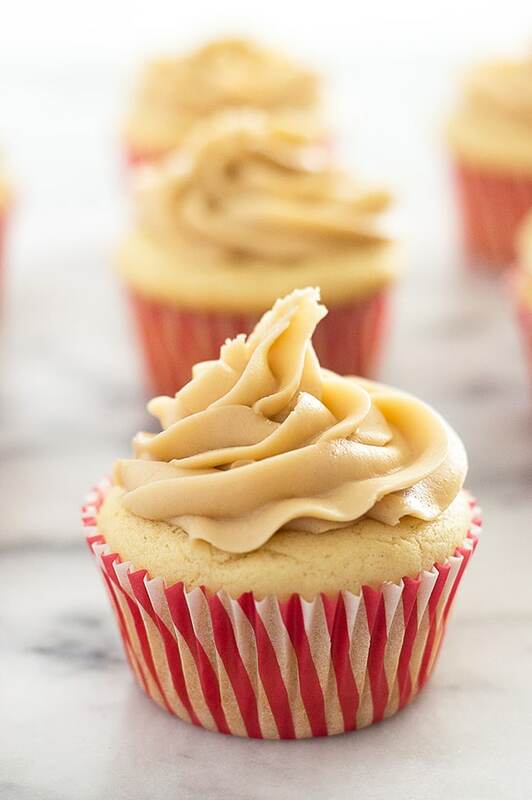 And obviously you have to top a cupcake this good off with something special, so we are going homemade caramel buttercream. 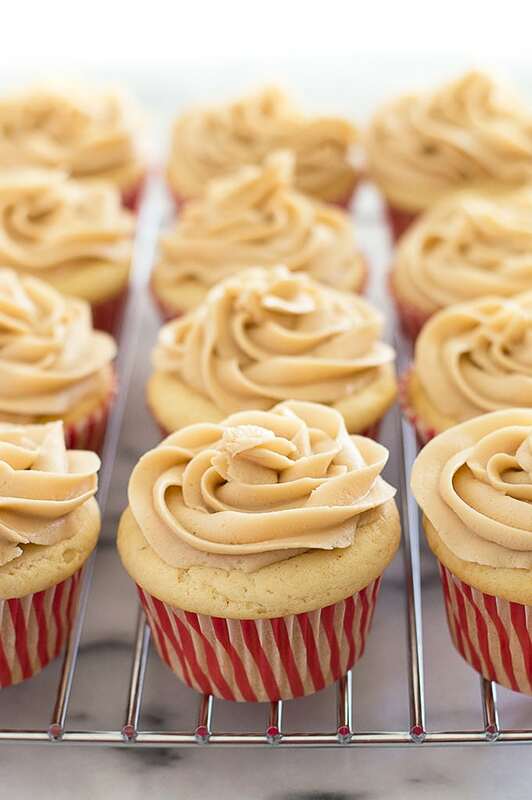 Don’t worry, this is an easy homemade caramel buttercream, so you don’t have to melt any sugar, just heat brown sugar, milk, and butter together and whip in powdered sugar. It’s aaaaa-muh-zing. These cupcakes come out so cute and fun. I had a blast feeding them to people and watching them giggle over the tiny pie hidden inside. They’re definitely a bit of work, but I think, well worth it! This is a delicious, but VERY sweet frosting. If you don’t like SWEET, either cut the frosting recipe in half or use a different, less sweet recipe. A simple vanilla frosting (<—That recipe makes a ton, quarter it for cupcakes) would be fantastic on these cupcakes. 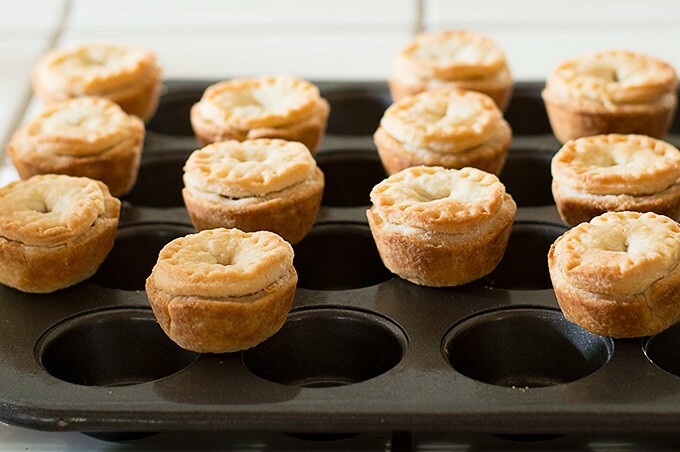 You’ll need a mini muffin tin to make the mini pies in this recipe. This is the one I own* and it’s great. The mini pies can be made up to two days in advance. Store in an airtight container at room temperature. You’ll only need about 1/4 cup of buttermilk to make your mini pies. Check out my post What to Do With Leftover Buttermilk for storage tips and recipes to use up the leftovers. In a medium, heavy-bottom saucepan, combine brown sugar, butter, and milk. Heat over medium, whisking occasionally until butter is melted and sugar is dissolved. Stop stirring and cook until mixture begins to simmer. Remove from heat and cool to room temperature, at least 1/2 hour. Lightly grease 12 cups in a mini muffin tin. Preheat your oven to 400°F. Combine diced apples, butter, granulated sugar, brown sugar, vanilla, cinnamon, nutmeg, and salt in a medium saucepan. Bring to a simmer over medium heat and cook for 4 to 6 minutes until apples are softened. On a well-floured surface, roll out dough to 1/8-inch thick. Cut out 12 2 1/4-inch rounds and 12 1 7/8-inch rounds*. Press larger rounds into greased muffin tins. Fill pie crust with apples. Top with the smaller rounds. Use a fork to crimp down slightly around the edges, and cut an x into the tops for steam to escape. Bake for 15 to 18 minutes until lightly browned and set aside to cool. Use a plastic knife to pop them out of the baking tray if any of them stick. Turn oven temperature down to 350°F. Line 12 regular-size cupcake cups with cupcake liners. In the bowl of your stand mixer or in a large bowl if using a handheld electric mixer, whisk together flour, sugar, baking powder, and salt. Add butter, sour cream, eggs, and vanilla and beat on medium for 30 seconds to one minute until very smooth, scraping the sides and bottom of the bowl at least once halfway through. Add about 1 heaping tablespoon of batter to the bottom of each of the cupcake cups. Place a mini pie in each of the cups and press down until it almost touches the bottom. 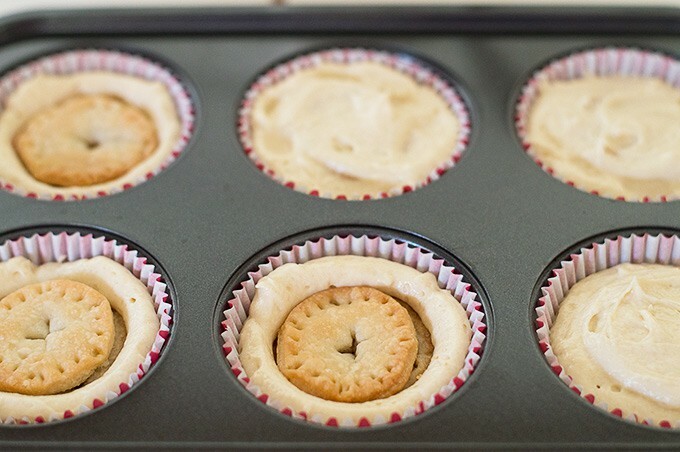 Fill the cups with just enough batter to cover the top of the mini pies and smooth over. You will not use all of the cupcake batter. * Do not overfill! . Bake for 15 to 18 minutes until cupcakes are set and the edges spring back when lightly pressed. Transfer cooled caramel to the bowl of your stand mixer add 1/2 of the powdered sugar. 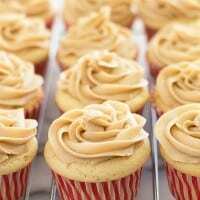 With the paddle attachment, beat caramel on medium until smooth and slowly add in the rest of the sugar until frosting reaches your desired consistency. *If you don't have biscuit cutters in these sizes, you can use cups approximately the same size as cutters, and gently stretch the dough to fit. *I had enough batter left over to make two plain cupcakes. You can discard it or cook extra batter for the same length of time as the rest of the cupcakes. What a fun idea. Great for this fall. Apple pie cupcakes?!?! OMG this is so right up my alley. Pinning!! Burtoween is a great idea. Big Fish is such a good film. I adore these cupcakes and can’t believe they have such a great surprise inside. Yay another Big Fish fan! 🙂 Thanks, Kate! Such beautiful swirls of frosting! These cupcakes are absolutely beautiful. I still remember the filming of Big Fish in my area when I was in high school. I think most of it is run down now, but a lot of people would visit the abandoned Spectre film set. Not sure if it is still open to visitors. Thanks, Tara! I was actually going to mention that the town was still there, but the post was getting kind of long. That’s so cool that it is in your area. I would love to visit it sometime!! This is a very interesting idea. Apple pie inside a cupcake. Cool!